Views in SQL is nothing but the logical table created from one or more tables.We can use the views to fetch the columns from one or more different tables at a time.In real life specifically views are used in Reporting purpose.To create a report we need data from different tables and need to show it on a single dashboard so we are using the views to fetch the data from different tables.View can contain all rows from the table or selected rows from the table. CLICK HERE TO GET INFORMATION ON MATERIALIZED VIEW…….. When user wants data or some columns from same table then simple view is used.For an example if there is employee table which has Employee_num,Employee_name,salary columnns and we just need to see Employee_num,Employee_name then user can create a simple view. We want to restrict data from the above table and show only Employee_Num and Employee_name then we will use the view. as Select column_name1,Coumn_name2 from tablename. 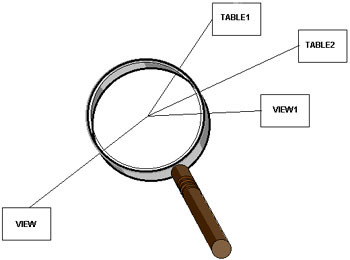 Complex view is created on using more than one tables.When user wants to retrieve data from more than 1 table then we have to use complex views.To create complex view there should be relation between 2 tables else cartesian product will come by joining 2 tables.There should be some joining conditions,some filters needs to be considered while creating complex views. We need to create view where we want to show the associated department to employee.Here We need to use complex join. If you have any issues regarding SQL Views or If you want notes in PDF format comment below section. Sure Deepmala..Kindly check your mailbox..
Hi, Please provide me the pdf doc. Sure Mohan ..I will send you interview questions.. I have sent you the notes and interview questions on mail. Thanks!! I have sent you interview questions on your mail id. Sure Ajit!!! I am sending you interview questions..
Could you send all topic in PDF format to my email id. Thanks in Advance!! Thanks! It is easy to understand. Please share sql documents and interview questions for experienced professional. Department code is the common column in both the tabels. Thanks for catching up the typo error.I have changed the typographic error and corrected it!! Sure I have sent you interview questions on your mail id!! Could you please provide the SQL ,Plsql notes. And also performance tuning related notes. sure sent you interview questions..
Could you please send me the notes in pdf format. I sent you Pdf format notes on your specified mail id. I sent you interview questions on your mail id. please provide the complex queries and complex questions of each topic of sql, if you have PDF regarding this please provide. Sure Kalpana..I have sent you some important complex sql Queries interview questions. Sorry Sentil for late..I have sent you interview questions on your mail id. Previous Previous post: What is ROWID and ROWNUM in SQL? | Difference Between ROWID & ROWNUM?